Jumping for Joy is a six-week class that provides unique opportunities for kids on the autism spectrum. 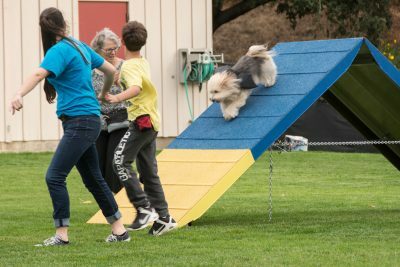 Utilizing our Agility park, kids learn how to run a friendly dog through an agility course, with the final class including a celebration and graduation with families and friends. Jumping for Joy gives each kid a chance to increase their confidence and social skills while problem-solving in a fun and safe environment. An added benefit is the unconditional love a dog can offer their handler. The dogs enjoy the work and serve as nonjudgmental partners in learning. The Jumping for Joy animal-assisted therapy teams are specially-trained, and the classes are led by trained teen volunteers. Advisors include a special day teacher and a Behavior and Training instructor. For more information please contact Community Engagement or call 415.506.6264.